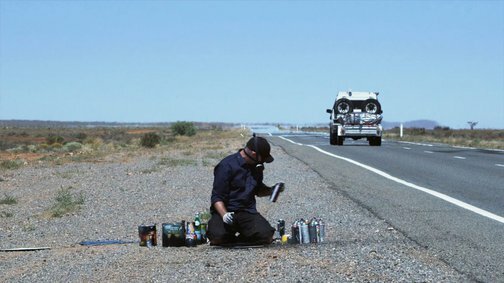 'Planet and stars sequence: Barrier Highway' is part of an ongoing series begun in 2001, in which the artist performs for the camera at different locations. While the sites of the work to date have been diverse - including an exclusive beach in Busan, Korea, a snow-covered park in Warsaw, Poland, and a graffiti-covered street in Queens, New York - the parameters of the performance have remained consistent. Gladwell is shown crouched on the ground in a protective mask with a stash of spray paints, here by the side of the Barrier Highway in remote New South Wales, around 80km east of Broken Hill. Various props also sit adjacent: tins of food and bottles, locally bought or found but implicated in a global network of production and trade. 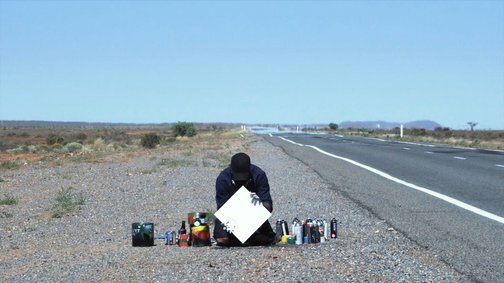 At the beginning of the performance, Gladwell holds up a white card - the ground for a painting he then sets about rapidly making. Using the props to screen areas from the aerosol, he produces an image of the cosmos, the planets and stars of the work's title. Once complete, he displays this to the camera before destroying the image with a layer of black paint. With great economy, this cycle of creation and obliteration, repeated in different parts of the world, connects the sublime and abstract forces of the universe with the more banal and pragmatic cycles of production, consumption, distribution and entropy that structure contemporary life. The 'Planet and stars sequence' series is from a larger body of work 'MADDESTMAXIMVS', parts of which were exhibited in the Australian Pavilion at the Venice Biennale in 2009. A second work in the Gallery’s holdings, 'Approach to Mundi Mundi', 2007, from the John Kaldor Family Collection, is also from this body of work. Signed lower c. certificate of authenticity, black fibre-tipped pen "Shaun Gladwell.". Not dated. Signed master and player Blu-ray disc, black fibre-tipped pen "Shaun Gladwell.". Signed l.r. corner print, black fibre-tipped pen "SG.". Tania Doropoulos, Shaun Gladwell: Interior linework/ interceptor intersection/ Campbelltown Arts Centre , 'Introduction', pg. 8-15, Campbelltown, 2010, 13, 109, 111, 145. Stephen Hepworth, Shaun Gladwell: perpetual 360° sessions , 'Extracts from the diary of a wanderer', pg. 6-13, Heerlen, 2011, 11, 84-89 (colour illus., video stills), 139. Maddestmaximvs: Planet and stars sequence , 'Planet & stars sequence', pg. 55-75, Melbourne, 2009, 56-58 (colour illus., video stills), 125, 137, 138, 150.